Michael Babineau knows construction. In 1999, he started Ultimate Construction as a one-man show. By 2014, the business had grown from six employees to over 200, bringing aboard Ed Cameron as Vice President, and Tom Thomason as project manager. 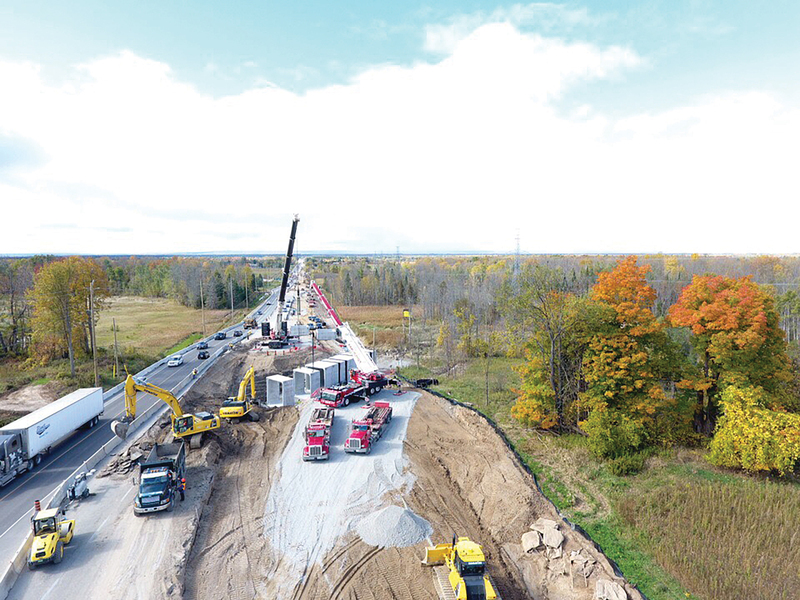 For the Simcoe County project, most of the Komatsu machines were bought for this location from ESS Limited. “The Komatsu PC490 excavator, a 50 ton machine, helps with the deep digging — 8 metres to be exact,” Cameron explained. “In 2012 we decided to go ‘full-blown’,” said Babineau, dividing Ultimate into two separate divisions. Heritage restoration, which includes restoring museums, churches, government buildings to name a few, and new residential and commercial construction — all across Canada. Ultimate also added a Civil division, to handle roads, sewers, water mains, parking lots and the like. “Our divisions are allocated as follows: Civil jobs are 40%, heritage 50%, and 10% to new construction,” explained Babineau. With the increase in contracts, Ultimate’s equipment needs began to grow. plus three precast box culverts. Located in Barrie, Ontario, the company recently moved from a 11,000 square foot location to 100,000 square foot location, which helps the company flourish without concerns of space for employees, parking, office space, etc. The challenge of this location is when employees are working heritage projects in the GTA, however the company actively works to assist with this challenge. 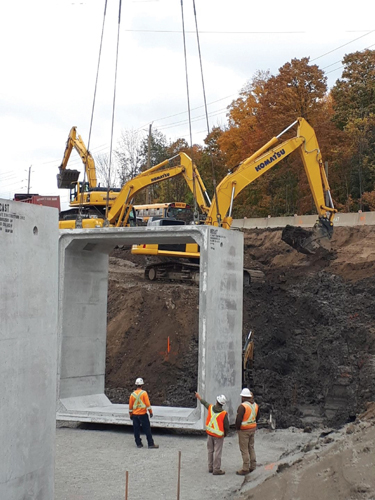 “The latest project Ultimate is working on is in Simcoe County on County Road 90, on a Phase 4 reconstruction,” said Ed Cameron. 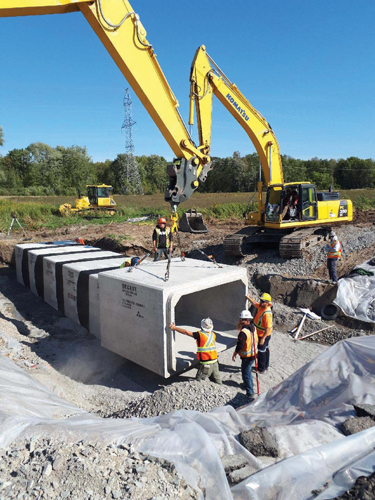 “The project includes three km of road, plus three precast box culverts,” he continued. One of the box culverts is a split between a drainage culvert and a snowmobile / deer crossing. 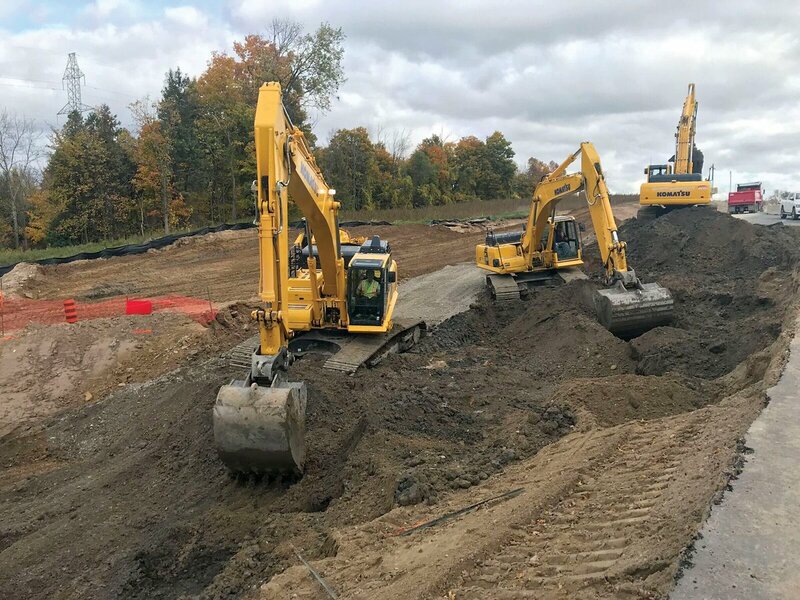 For the Simcoe County project, a majority of the equipment used for this location are Komatsu machines purchased from ESS Limited. “The Komatsu PC490 excavator, a 50 ton machine, helps with the deep digging — 8 metres to be exact,” Cameron explained. and a snowmobile / deer crossing. “We also have PC350s, WA470 loader, WA320, D61PXi-24 and D51EXi-24,” he added. “Komatsu’s technology has helped us tremendously. The setup of the Komatsu’s GPS being integrated in the machine, has helped grade better, with no post/masts/wires, there is less physical and visible obstruction on the blade. Being integrated also helps to deter theft and damage,” Cameron explained. “The power and visual on the dozers have made the operators proud to run these machines,” Cameron said. “When grade checks are completed, they are accurately completed to within half an inch,” he added. Cameron explained they achieve substantial fuel savings without compromising power. “The accuracy of the ‘Intelligent Machine’ results in having to staff one less employee/grade person. ESS provides an Energy Savings Report monthly, that helps Ultimate Construction track these savings,” he added. “Aleksander Korczynski (Technology Solutions Expert) at ESS assisted with setup, but overall it was easy — ‘plug and play’,” Cameron said. “They have proved there is no need to fear Intelligent Machine Control (Grade Control),” he added. “For our first deal with ESS, they had a competitor’s machine digging next to the Komatsu PC350LC-8,” Cameron said. 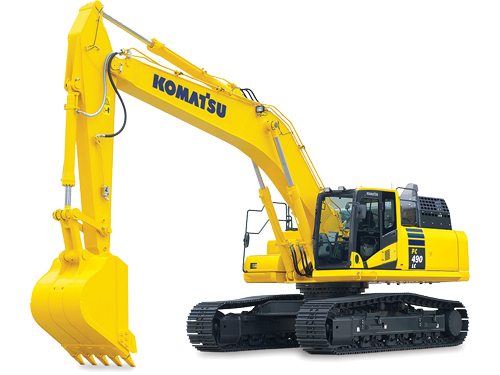 “The Komatsu out-performed the competitor’s machine,” he explained. 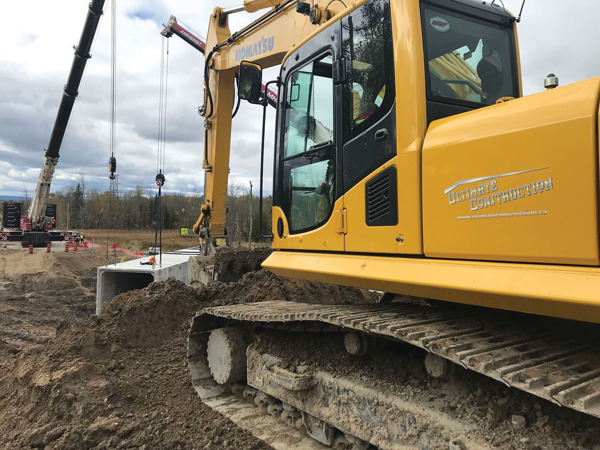 During the purchase process, Babineau said, “it turned out the Komatsu ‘Value Proposition’ won out on this deal, even though a competitor had suggested otherwise. 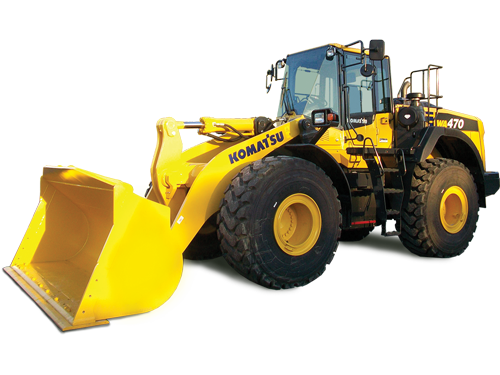 The competitive offerings didn’t compare to Komatsu’s premiere warranty (travel inclusive) and maintenance. Our risk was eliminated with a superior package of maintenance and warranty, taking any fear out of the purchase,” he continued. “They offered us great finance terms, which helped get us going,” he added. Ultimate Construction has had great results working with the support team at ESS, particularly Aleksander Korczynski (TSE) and Shawn Auld (Territory Sales Manager). “ESS is always there when we need them to minimize downtime,” said Cameron. “If we need any help with our GPS, Aleksander is there quickly. Overall the experience was fantastic for the Ultimate Team,” he continued. Ultimate Construction has the distinction of being one of the Top 5 Heritage builders across Canada. For the future, Ultimate is predicting a stellar year coming up with their Civil & Heritage arm doubling in size and scope. They are already outpacing last year’s earnings and are looking to double earnings this year. “We don’t see any slow down in 2019!” said Cameron. The PC490LC-11 with an operating weight of 105,670 lbs (47,930 kg) to 110,220 lbs (49,995 kg), is a large performance-oriented excavator with reinforced undercarriage for high lift capacity, lateral stability and added durability. The PC490LC-11 leverages Komatsu engine technology to provide a productive, dependable and efficient Tier 4 Final emissions certified machine that does not interfere with daily operation. An enhanced Power Mode provides improved hydraulic flow, reduced cycle time and better productivity than the previous model it replaces. The PC490LC-11 is ideally sized for high production earthmoving applications while be easily transportable. The comfortable and quiet cab includes a new air suspension, heavy duty, high back, heated seat with integrated controls. The 7 inch, full color monitor and separate full color rear view monitor allow the operator to effortlessly monitor key information. Introducing the next generation of machine control. Intelligent Machine Control machines have the following advantages over dozers with external grade control systems. Automated operation from rough dozing to finish grade. New dozing mode, load control performance features. Standard factory installed integrated system. No coiled cables between machine and blade. GNSS antenna and mast removed from blade No daily connections required between machine and blade. For more information about Ultimate Construction, visit https://www.ultimateconstruction.ca. For more information about Equipment Sales & Service Limited, visit https://www.essltd.com. 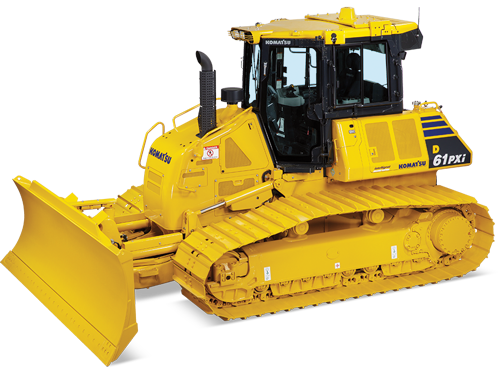 For more information about Komatsu construction equipment, visit https://www.komatsuamerica.com.